Again, it is time for the weekly Doctor Who review! It is for episode 3 of Series 9, titled Under the Lake. If you haven’t watched the episode yet, beware of Spoilers ahead. First off, I want to say that I had no idea that pretty much all the episodes this Season would be 2-parters. Officially there are 4 declared ones, but you can’t tell me that “The Girl Who Died” and “The Woman Who Lived“, which play in consecutive weeks, aren’t a 2-parter as well. That leaves only 2 episodes as standalones and that is not a lot for a whole season. Don’t get me wrong, I like the longer stories most of the time, but it messes a bit with the Season-arc because it focuses more on the episode-storyline. Well, we will see how it goes in the following weeks and either way, I really, really enjoyed this week. 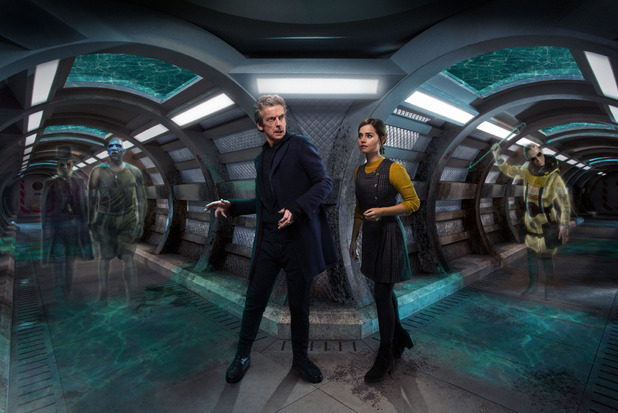 The Doctor and Clara land in an underwater base in 2119. Shortly before their arrival, the crew has discovered a spacecraft nearby and brought it to the base. Ever since then, there are ghosts haunting the base and trying to kill the remaining crew. The ghosts are messing with the base, so that the Doctor and Clara are separated. He wants to go back in time to find out what happened, but shortly before the episode ends, Clara sees the Doctor’s ghost floating her way and knows that something went wrong. It’s been a while since I’ve really been enthusiastic about a Doctor Who episode, but I thoroughly enjoyed Under the Lake. It was scary, it was funny and it had a lot more Doctor than in the past couple of episodes! First I want to appreciate that the BBC included a deaf actress/signing person into this episode. The community is barely represented on television. (Except for Switched at Birth and Nyle participating in America’s Next Top Model not much comes to mind.) So, I think it is great that they found a way to incorporate it in the show. But on to the content of the episode: By using plain old ghosts, they definitely toned it down a little, but that is maybe a thing I liked about the episode. Not everything needs to be ampted up all the time! Also, I think it’s great that the TARDIS stepped up her game and decided to bring them there because she knew the Doctor was needed. Whenever the TARDIS doesn’t really want to be at a place but brings the Doctor anyway, I have the feeling it’s going to be good. Speaking of the Doctor, he was on fire tonight – speaking to the TARDIS, having index cards to master human communication and just delivering some great lines in general (“So who’s in charge now? I need to know who to ignore.”). He was back to old spirits, being as enthusiastic as a child about finding out that there are real ghosts and not knowing what they actually want. And those ghosts were actually scary! The real shocker was the cliffhanger though and I have no idea what it means. I can’t imagine the Doctor dying – not like this, he would regenerate after all, right? Either way, I had fun tonight and am really looking forward to next week! What did you think? Did you think it was as entertaining as me or was it more flawed than I wanted to admit? P.S. : Unfortunately it seems like the sonic sunglasses weren’t a one-time-thing, but rather are here to stay. I am sorry, but they just don’t do it for me. And as I said last time, I won’t ever accept them. They actually announced well before the series started that it was going to be full of two-parters. Apparently Moffat doesn’t want us getting used to any sort of format and wants to shake things up this season. Not a bad idea, if you ask me. Wearable technology aside, I liked this episode very much as well. You know me, I love a good ghost story, and this one is very different than your average tale of spirits. Based on the code in the episode–“The Dark, The Sword, The Forsaken, The Temple”–reminded me of a Lovecraft story I read recently, and something I saw in the next episode preview made me think of good ol’ HP Lovecraft as well. Actually, the cryogenic sleep chamber could be thought of as a tomb for the living dead to sleep in, so I guess they’re really going for the traditional horror elements here. I also liked that they included a deaf/signing character in the story. I took a deaf studies course one semester and it left a huge impact on me. I’ll have to see if my teacher’s still at Ohio State, she’s deaf and she’d love to know that there’s a deaf character in a widely popular show. I can’t wait for next week, the preview made it look super creepy, and gave the Doctor a few challenges to sort through. Augh, only 7 days to go! By the way, did you hear that there’s going to be a new spin-off of Doctor Who? Apparently it’s called “Class” and it centers around kids from Coal Hill getting involved with aliens and other stuff like that. I’ll check it out when it comes out, but I was hoping for Torchwood season 5 or something involving the Paternoster gang! I knew that there were more 2-parters than usually, but not THAT many. An average season has 3 and this one has 5. I think it’s a bit overkill. I saw one promo for next week, where I saw the actual alien. I wonder if it’s in the tomb or not though.7 days is a loooong time for the wait when a cliffhanger like this is involved. You’re one of the few. John Barrowman’s expressed interest in more Torchwood and so have a lot of fans. It’s not that I don’t want Torchwood back, although I hated Season 4 and sometimes deny its existence. I really would like it back, but none of the showrunners or networks have expressed any interest. So, I am not too hopeful. At least they’re still producing audio dramas. That shows there’s still a market for Torchwood stuff. And perhaps someday the fanbase will bring Jack Harkness and Gwen and the rest back. They somehow did it with Veronica Mars (which I have no clue really what it is, but whatever), so why not Torchwood? Stranger things have happened, and not all of them in my daydreams. Veronica Mars was crowdfunded and is an AWESOME show 🙂 I won’t compare it to Torchwood, because they are nothing alike though. It is true that shows can be brought back, I am just saying that I am not holding my breath. So what’s Veronica Mars about, and why is it so popular that the fanbase can crowdfund it to come back in some form? Veronica Mars is a teenage girl, who, after the murder of her best friend, sort of becomes an outcast at school and helps her father, who is a Private Eye. She’s pretty darn good at that job and people from school, who don’t even like her, ask her for help. It’s not bubbly-teenage-y at all though but it does have an epic love story. Veronica is extremely snarky and sarcastic. She’s very smart too and was my heroine when I grew up. The actress who plays Veronice, Kristen Bell, started the crowdfunding campaign together with the creator and writer of the show. They didn’t get it back on TV but they made a really good movie and even had almost the entire cast from the past appear. It was Kristen who initiated it all, so I guess Barrowman would have to be more pro-active if he wanted Torchwood back. Knowing him, all he’d have to do is promise tickets to a concert or something and he’d get donations pretty quickly. I’ve seen videos of his performances. They are something else. True, I never said that the fans wouldn’t support him. He just has to initiate it. Let’s tweet him and see if we can get him to start something! Sure, what should we say? “@JohnBarrowman, could u do 4 #Torchwood what the fans did 4 #VeronicaMars?” or something like that. I’m not sure he’ll know what we mean by that. Let me sleep on it! I gotta go now. I already did it. His Twitter handle is @Team_Barrowman. Thought it was a great story — a Classic Series base-under-siege homage (the name of the base is a play on the name Victor Pemberton, who wrote “Fury From the Deep”, the 1968 underwater base-under-siege story), with creepy monsters. The deaf character was included as a plot contrivance because they needed someone who could read the ghost’s lips, but the actress gives her a nice amount of extra depth. I also like the idea of the story taking place in two different time zones!